The staff at Segway Tours of Gettysburg now officially hold two records in the Guinness Book of World Records! 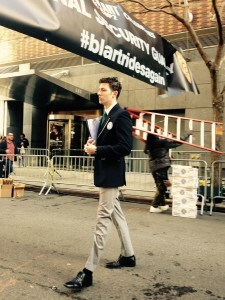 Our shop was closed last Saturday because we took the whole fleet to New York City for the premier of “Paul Blart: Mall Cop 2.” The movie promotes a stereotype that we don’t especially like to encourage but we were invited by Sony Pictures to participate in two Guinness World Record attempts as part of the movie premier festivities. 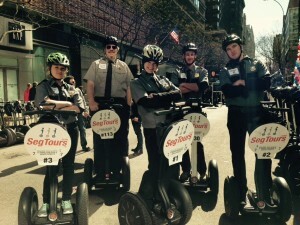 Segway tour companies from Washington D.C., Chicago, and Philadelphia brought their fleets too and we had a total of 112 Segways that filled the street at 67th and Broadway. Sony provided a crowd of security guards and we successfully broke the records for (1) the largest number of people trained to ride Segways at once and (2) the largest number of people doing a 360-degree turn on a Segway at once. 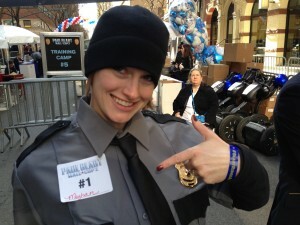 They dressed up our staff and the other trainers as security guards too (in the theme of the movie). Kevin James joined us for the on-camera breaking of the records. Here are some other photos and videos of the event. Jessie, Bob, Meghan, Jacob, and Aaron: Too cool for words. 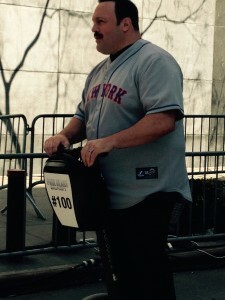 Kevin James, the star of the movie. The official from the Guinness Book of World Records. Jacob on the Today Show showing off his training skills! 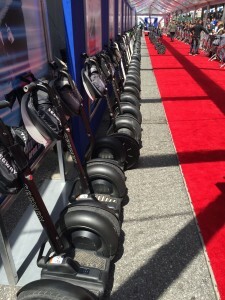 Our Segways lined up on the red carpet. Now I’m off to update my resume with two Guinness World Records….